"I was inspired to create my own fusion-cuisine pizzas after a local pizza place appreciated my concepts and added it to their menu! Tried these ideas on my family and friends, and they loved it!" Place pizza crust on a baking sheet or pizza pan. 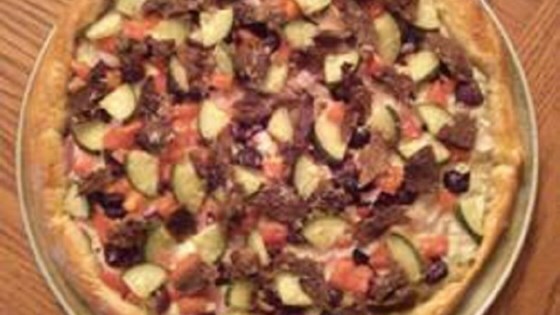 Spread tzatziki sauce over crust and top with beef, cucumber, olives, feta cheese, and mozzarella cheese, respectively. Brush egg yolk over exposed pizza crust. Bake in the preheated oven until cheeses are melted and crust is shiny golden brown, about 15 minutes. See how to make a pesto and potato pizza. Substitute beef with your favorite souvlaki (chicken, lamb, shrimp), but make sure meat is fully cooked. Drizzle a light coating of extra-virgin olive oil over pizza once cooked if desired.